History of Micheldorf - micheldorf-gvs Webseite! There are first evidences of settlement here in Micheldorf from times around 400 B.C when the Celts started settling here. As from 113 B.C Micheldorf was a part oft he kingdom Noricum, the center of which was at the Magdalensberg. The capital city was Noreia. It might have been situated between Neumarkt and St. Veit which means it was not far from Micheldorf. About 15 B.C. Carinthia was conquered by the Romans. A famous Roman road existed from Treibach into the Mur-Valley. This road was nearly equal to the one that is our Murtalstraße today. The Romans ruled this region untill the 4th century. Then they withdrew and left Carinthia (Noricum) on ist own devices. Around the year 500 A.C. which means at the beginning oft he Middle Ages the Slavs came to Carinthia. They tried to escape from the Avars and founded a new center in Karnburg near Klagenfurt. At the end oft he 6th century the Awars invaded Carinthia, plundered and suppressed the people. Many toponyms are based on that times: Gulitzen, Grafendorf, Olsa, Grebenze, Friesach, Zeltschach etc. The Bavarians came to help the Slavs. Finally the Bavarians ruled and founded the settlements Hirt, Micheldorf and Schödendorf. In 860 the Royal Court of Friesach was given away to Salzburg. During the following 900 years Friesach was the most important base there. Approximately at the same time the church at Lorenzenberg might have been built. On September 29th, 1074 Micheldorf was first mentioned in the directory of archbishop Gebhart von Salzburg. Old Roman roadmaps show that there has been a settlement on the area of Micheldorf much earlier. In the middle oft he 15th century the Turks conquered Carinthia several times. The Church Lorenzenberg was fortified by the population to provide shelter. In April 1797 the French came and conquered Micheldorf. They desecrated the church and plundered it. During the 1860s „Kronprinz-Rudolph-Railway“ was built from St. Michael in Styria to Villach. World War I and World War II were really bad times for Micheldorf, too. Aircraft bombs destroyed parts of the village e.g. the station in Hirt. After the end of World War II the Englishmen occupied Micheldorf. During the 1960s the roads in the village were asphalted and pavements were built. Street lightning was installed and the outdoor pool was opened. 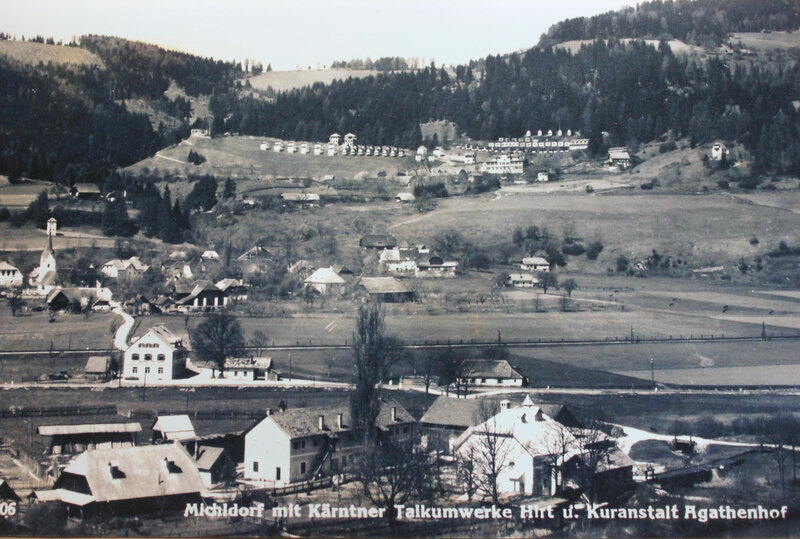 In 1973 Micheldorf came to Friesach. Since 1992 Micheldorf has been an independent community again.